When nothing but lobster will do, dive into a bountiful Maine Lobster Lover’s Feast. This delicious two-course meal makes a wonderful surprise for your guest, family, or friends. Start your lobster feast with a creamy and flavorful lobster bisque. 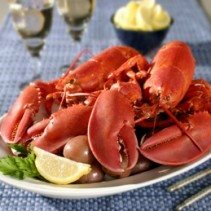 Then delight your guests with a main course of live Maine lobsters ready for boiling or steaming. Just add butter and cocktail sauce for a dinner experience that’s hard to beat. The Lobster Lover’s Feast makes an excellent holiday meal or corporate dinner too.